Bokkan the Tatar mooned pies. In the different districts of Tatarstan of them "taka" name also. 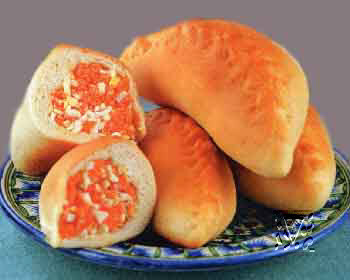 Bokkan is characteristic for rural locality and prepares with the different filling. Most widespreaded carrot, cabbage, vegetable marrows and potato. To wash down a carrot, clean, boil to mildness in the small amount of water (20-25 minutes), after to cool, finely to cut, mix up with sugar and leave on 10-15 minutes. To clean the boiled eggs from a shell, finely cut, mix up with a carrot, salt, pour the kindled butter and good to mix. To cut dough on marbles weighing an about 90 g each, to roll in small cakes. On one half of every small cake to lay out filling an even layer, cover the second half, pinch together the edges denticles and to give of the bokkan form of half moon. To smear a roasting pan the small amount of oil, to lay out bokkans. To fluff up an egg, smear the surface of patties. To warm up an oven to 1800С and bake bokkans during 30 minutes, after to smear a butter and to serve up. On one bokkan: a 90 g of dough, 80-100 g of carrot, 1/4 eggs or a 20-30 g of the boiled rice, 15 g of butter, granulated sugar, salt.